If we live, we live to the Lord: and if we die, we die to the Lord. 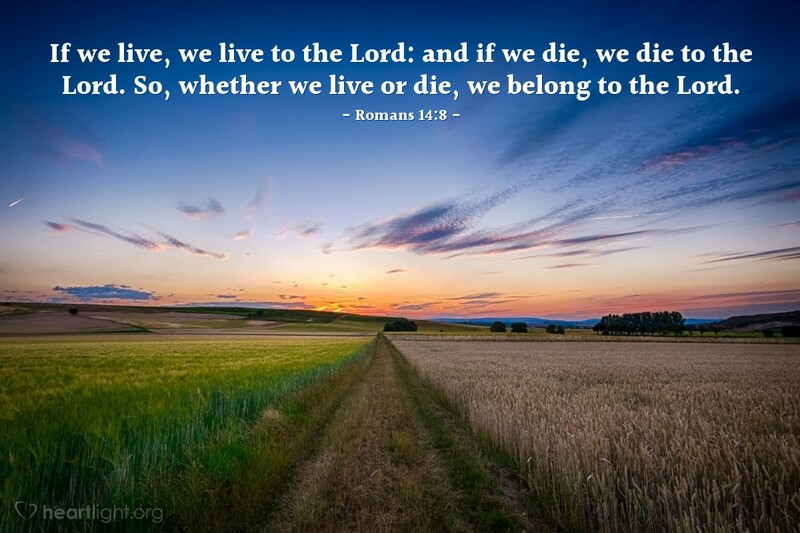 So, whether we live or die, we belong to the Lord. One of the incredible realizations we have as Christians is that our relationship with the Lord is eternal. As we seek after him, he is always there and no one can separate us from his love. Even when we die, we go to "be with the Lord." When we sleep in death, we are still "in the Lord." When he returns in glory we will go to "be with the Lord forever." Everything we have on earth is temporary except our love for the Lord Jesus, our praise of God through him, and our friends with whom we share that love and praise! Almighty God, thank you so much for binding yourself to our world in Jesus and binding me close to you through his lordship in my life. I look forward to the day when the Lord I kneel to worship today will be recognized by all the living and the dead as the One True Lord. I commit to live this day to honor him, and I know dear Father, that by honoring him I honor you. I praise and thank you for the gift of Jesus' eternal and abiding lordship in the name of the Christ my Lord. Amen. Today and over the last several weeks, our brothers and sisters in Iraq and many other places in the Middle East and Africa, have had to make the ultimate sacrifice for their faith. They have been servants to the end. Some have been crucified. Some have seen their children beheaded before they were killed. They have had their earthly lives destroyed. Please take a minute and go to Voice of the Martyrs and learn more about their plight and pray about ways you can help. Thank you! Phil Ware & the Heartlight.org, VerseoftheDay.com, and aYearwithJesus.com team.